Hello again my beloved readers! 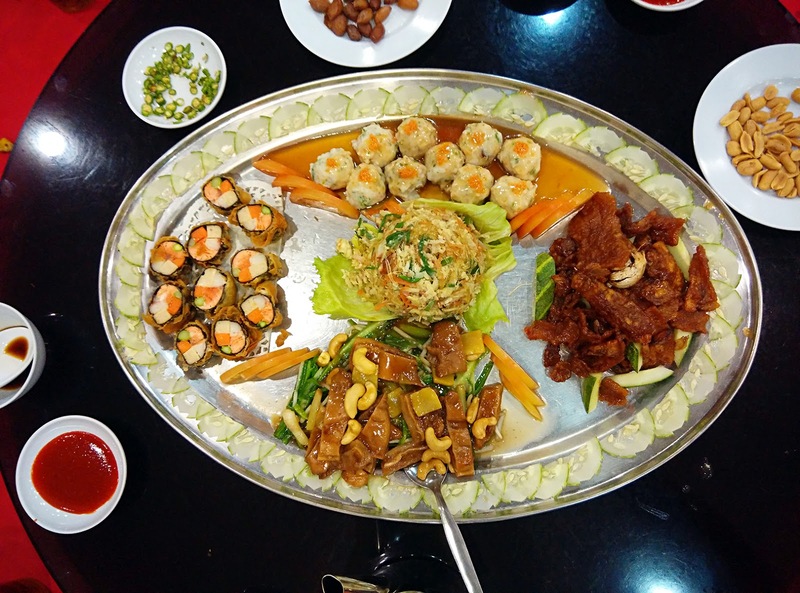 Last month we celebrated Mother's Day with my mum and godmums at Foong Wei Heong restaurant which is situated in town. 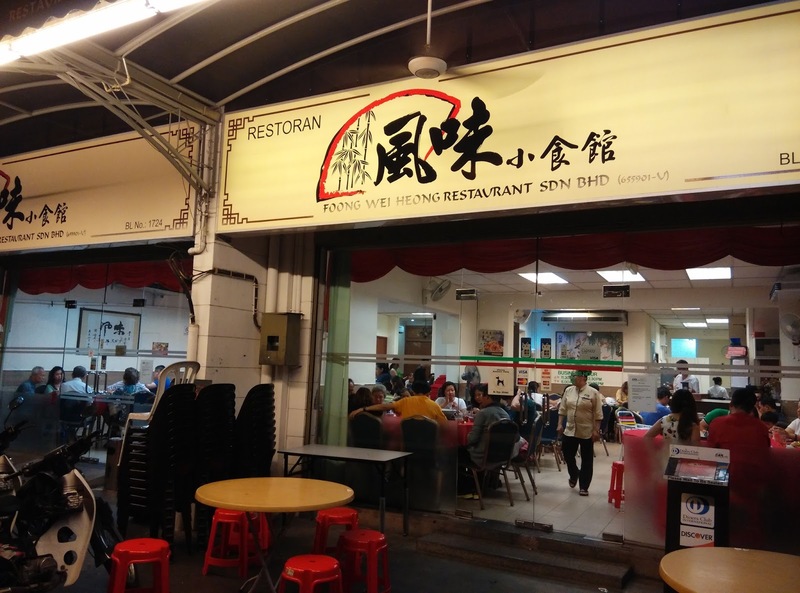 My mum suggested this place to her relatives coz my parents has been patronizing this place for a long time and they felt Foong Wei Heong serves one of the best Chinese cuisine. 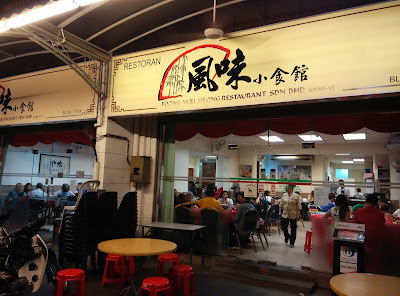 Every time we pass by the lane beside Penang road this restaurant doesn't fail to look full house. See what I mean, you really have to book at least 3 days before you arrive. 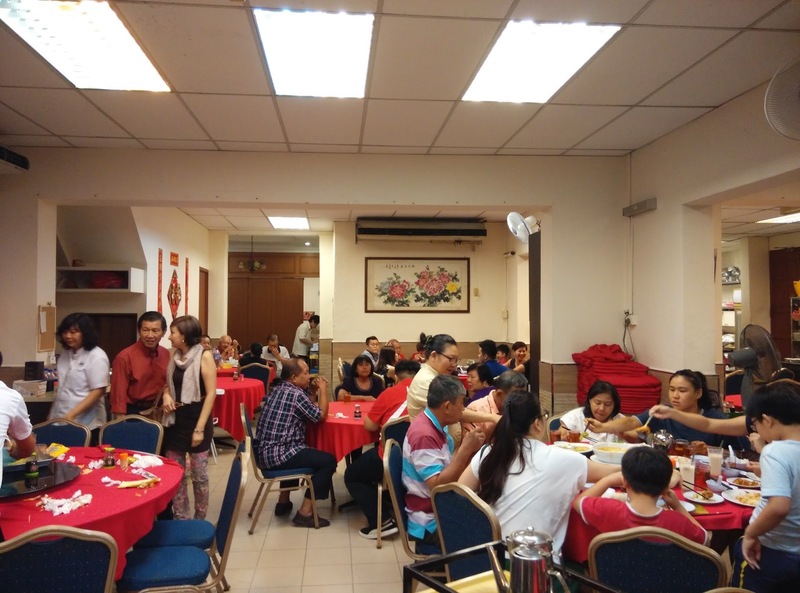 Besides individual customers, it also holds banquets and weddings. The serving time is surprisingly efficient. Once we told the manager that all guests have arrived and can start serving, the food arrives almost immediately Well, maybe coz we booked beforehand but with huge amount of guests makes you wonder. Sorry, photos of the rest of the 16 family members who attended are private. 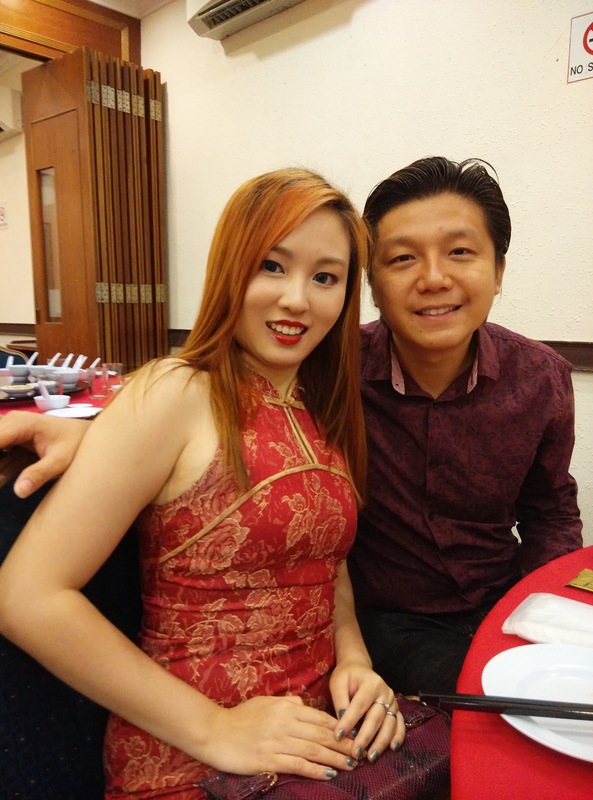 Our menu rate was RM636 +6% GST + 10% service charge per table. Since it's Mother's Day, the restaurant manager told us the pricing was slightly higher than normal. First was 4 season platter. 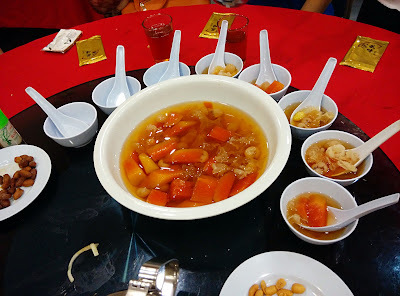 Instead of just 4 dishes like most Chinese restaurants serve, this hs an extra one in the middle. All of the cold and warm dishes were tastefully cooked. 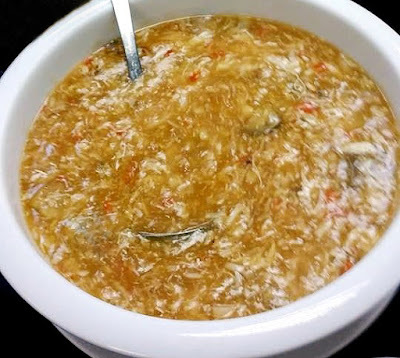 Sharkfin soup with loads of crab meat was served as second dish. This restaurant serves the best soup in town! Another delicacy is crispy duck skin with crisps and meat served on side. 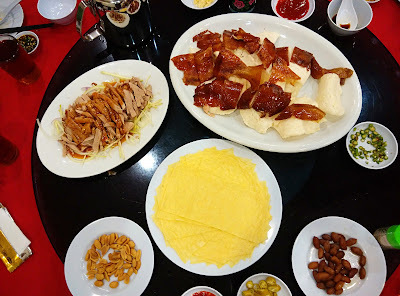 How I usually eat is to smear the sweet sauce onto the egg crepe then topped with a strip of cucumber, spring onion and a piece of duck meat and skin each. However way you eat it this meal is sure to be mouthwatering. 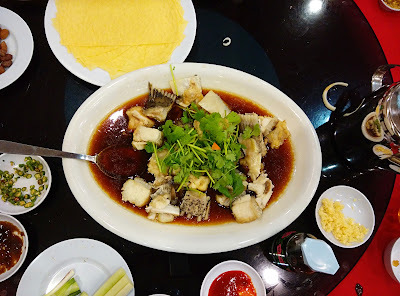 Fourth dish was steamed fish in soy sauce. Not sure what type of fish this is but its definitely not my favourite of the entire 8 course. Supposedly due to it's large size that makes the meat tough to bite on and cut into cubes unlike usually served in a whole. Stir fry brocolli and mushrooms with bean curd skin in oyster sauce was the 5th dish. 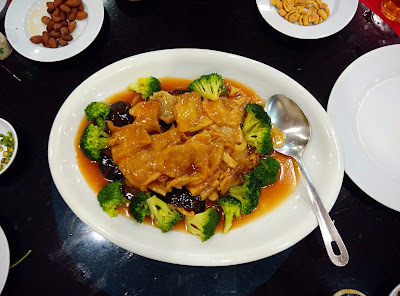 Quite normal I must say for I was expecting pieces of abalone fillet but the sauce is yummy tho. 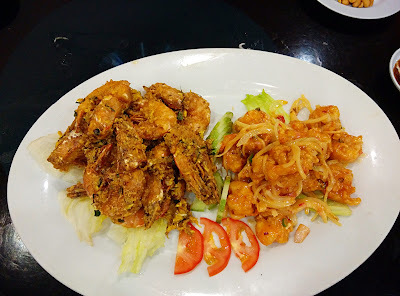 Prawn cooked in two way (fried with nestum/sweet and sour salad) was the 6th dish. I prefer the salad type as I don't have to peel them. The deep fried ones are very fresh and crunchy. Final savoury dish was the delectable fried noodles. I must say this is my favourite of all besides their soup. 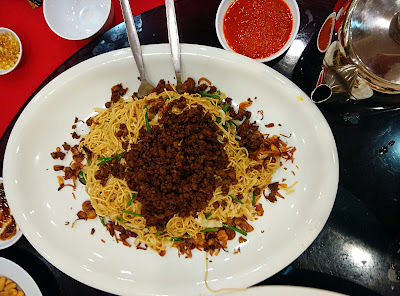 You definitely must try their fried noodles. A warm dessert of papaya, gingko, lotus seed and white fungus to end our Mother's Day dinner. Will I come again? Yes, we will surely come again even when it's just a dinner between me and hubby as I've seen they do serve couples and individuals as well. Address: 23 & 25, Jalan Sri Bahari, 10050 Georgetown, Penang.